Created by Rocky Patel and Jonathan (Acid cigars) Drew. This joint venture by two of the industry's hottest cigar makers presents a medium-bodied cigar. The Java is one of the more popular Drew Estate concoctions. Coffee and cigars have been long time compliments but the Java really puts a new twist on this taste with a medium bodied blend that has strong espresso notes with hints of chocolate. While the cigar has dominating flavors, it still maintains a lot of its premium tobacco qualities from its Nicaraguan fillers. 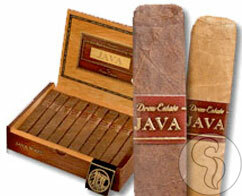 If you are a fan of cigars made by Drew Estate, the Java is not to be missed.